Not too long ago, many eyes were looking down on Governor Jan Brewer of Arizona. She signed a bill that was viewed as racist and discriminatory as it allowed state officials and police officers to question the citizenship of any one they run in to and gave them the authority to demand to see documentation that proved that the citizens in question were in fact legal citizens of the United States and not illegal immigrants. Sure Brewer’s bill was a crack down on illegal immigration, however, it was also a slam against any citizen that even seems, by their appearance, to be from another country. But now, compared to the new legislature in Alabama, what Brewer did seems tame. Where Brewer gave police the option of asking to see documentation of people they suspect to be illegal immigrants, Robert Bentley, the governor of Alabama, is making it mandatory that police officers check whether or not the person they have stopped is in the country legally or not. The Republican governor says that any time a police officer thinks the suspect might be an illegal immigrant, they must inquire even if the person is being investigated for another reason. In addition, it is now also going to be illegal to house an illegal immigrant or to provide them with transportation. Students will also have their legality checked, which brings into question whether Bentley would deny a child education. And companies that hire illegal immigrants will be fined. 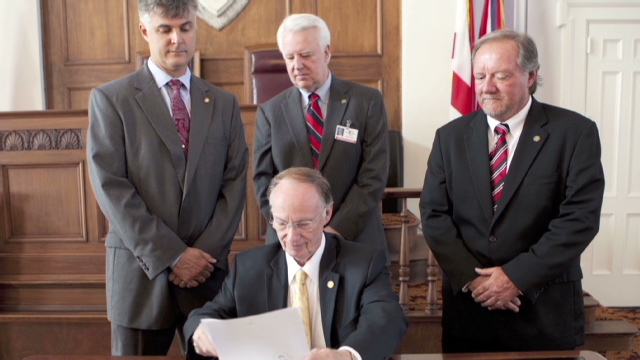 Bentley signed the law on Thursday and it will go into effect beginning September 1st. John Merrill, a Republican Congressman from Alabama, supports the bill and said it was made to “provide equal opportunities for all people who want to come to Alabama legally.” He also said that the bill is written in such a way that it is likely to survive any and every legal opposition. The bill is already drawing criticism from various civil rights groups and numerous Americans from all backgrounds just hours after it was signed. The most common criticism of the legislature is that it is extremely racist. It is peculiar why in a time of economic crisis, the Alabama state government chooses to crack down on immigration in a way that is practically asking police officers to racially profile everyone they encounter when they could instead focus their budgeted funds on restoring the state’s economy. Furthermore, in a nation made up of immigrants, how is it possible to fairly tell who is legal and who is not simply by appearance? Granted there are more Latin immigrants that European or Canadian, but who is to say that a man from Puerto Rico is more likely to be in the United States illegally than a man who is from England? This is preposterous. I really feel for the immigrants in this country but even more so for the american citizens being directed by such shortsighted leadership. What can really be accomplished with these acts? History has proven that the illegals will find a way to survive. Not eating, not being housed, not working…. good luck!